Don't Sit On The Sidelines In The Game Of Life! I have been doing a lot of reading about the Law of Attraction in the past few weeks. Just felt like sharing this video because it illustrates so well, how I feel about me and the choices I make in my life! Hope you find it to be just as motivational! 1. SLEEP needs to be priority. Research supports the fact that 95% of us REQUIRE seven to eight hours of sleep to be fully rested and function at our optimum levels. Think you don't have that kind of time to sleep... Consider setting a specific time to turn in and before you do, write down anything that is on your mind. This will allow you to put your worries aside for the night and won't keep you from falling asleep. 2. Think premium thoughts. Do you find yourself obsessing over a negative situation? Those thoughts can be draining. It is quite easy to notice all that is wrong in our lives rather then what is right. Take time in your day to thank someone or just share a positive emotion. Remember to celebrate your victories no matter how small! 3. Expand your mind. It is not the amount of time you spend working that determines the value of your product or service, but rather the quality energy that you are able to give to the situation. Consider doing a little meditation. It lowers your heart rate and relaxes muscle tension. Every sixty to ninety minutes in your day, stop what you are doing! Take two or three minutes to close your eyes and breath deeply. Focus only on your breathing pattern by pushing every bit of air out of your lungs and slowly fill again. You will help provide your body with a burst of endorphins that will make you feel happier and alert. 4. Keep a list of everything - YES, everything that you want or need to do! As you process and download those thoughts, the less energy you waste on thinking about undone tasks. You will also be present in the moment and fully engaged in the task at hand. 5. Define your time. Whether you work remotely, work from home or are a full time parent, we tend to carry our day with us well into the night. Consider establishing a specific way to disengage from the events of the day so you can leave it behind and begin the renewal process your mind and body needs. Take a few minutes to share the day with someone or go for a short walk to help divide your day up. You really should make yourself a personal priority! We all have the same 24 hours in a day, so make the most of them by implementing these 5 strategies to reclaim your quality of life! I would love to hear what tips or techniques you use to boost your energy and live life to the fullest! 10 Reasons to Start a Facebook Fan Page! You don't have a Facebook Fan Page for your business? YOWAZ!!! You're missing out on one of the best ways to promote your service or products. Facebook Fan Pages are distinctly different than your regular Facebook Profile that you get when you log in. Your Profile is your personal space on Facebook where you decide who gets to see the items you have on your page and how much you want to see of theirs. While you can have up to 5,000 ‘friends’ it is quite limiting and is not designed to be used for business purposes. Honestly the primary reason for having a Profile is to keep in touch with people and to follow what is happening in their lives. You might be wondering why not start a Group Page? There are several reasons why Fan Pages are better for business, but let me touch on the most important one. Unlike Groups, Fan Pages are indexed by search engines. This means the content on them is visible to unregistered people (non Facebook users). Fan Pages will increase your visibility to more potential fans and customers online. FAN PAGES ARE FREE ~ There is no better value for your time or money than creating a Facebook Fan Page. Go to any Fan Page, and on the bottom left is a link for “Create a Fan Page for Your Business.” Click that link and follow the instructions. A basic Fan Page can be created in under 10 minutes. FAN PAGES ARE EASILY MANAGED ~ Once you've added your basic information to the page, it is simple to go back and edit or add to the content you want offered to the visiting public. There are now consultants you can hire if you desire help setting up the page for your business. TODAYS ADVERTISING WORLD ~ Social media marketing is essential in this new era of advertising... without it businesses are not able to capitalize on the growing Facebook population which currently boasts more then 600 million active users that spend over 700 billion minutes per month on Facebook! PEOPLE WHO "LIKE" FAN PAGES ARE OPTING IN ~ It is automatic; the customer does not need to wait for acknowledgement as with a Profile to hear about your business. They are taking an active step to participate in conversations with you as a business person, to hear your message – they want to hear from you! FAN PAGES GET INDEXED BY SEARCH ENGINES ~ Google and Yahoo index them because they are public. Profiles are not because they are private. Basically, your Page acts as a website, another avenue into your business that the entire world could have access to with a few clicks. Use of keywords that people are searching for is important. You are quickly establishing an online presence. FAN PAGES KEEP STATISTICS ~ When you manage a Fan Page, Facebook installs “Insights” which are statistics about your Page. For example, you can see how many times your posts received comments or “likes.” In addition you can view the number of fans that visited and see where they came from. It will chart your statistics the last month showing interesting facts about the success of your Page. You can easily monitor and adjust your activities. FAN PAGES ARE HIGHLY CUSTOMIZABLE ~ Profiles are not. With the Static FBML application, you can create custom welcome pages, product pages, a page about your Why story, or about the benefits your business has to offer! Events, links, discussions and many other applications can be added as needed. This cannot be done on a Profile page. FAN PAGES CAN BE PERSONALIZED ~ If you do not have your own website or blog, this is a fantastic feature... Even if you do, this is a wonderful addition to your other sites. With company sites, options for expressing ourselves are limited – sometimes the only thing we can edit is our contact information. Through your Fan Page, you can share stories, give advice, offer helpful information or articles about related topics. FAN PAGES ALLOW FOR DIALOG ~ As you share information with customers or potential customers, they can comment or “like” your posts. You are able to respond and have two-way or even group communication about the topic. This leads to rich interaction which builds trust and rapport with your visitors. On a Fan Page you all share something in common to start with – the love of your product or business opportunity. FAN PAGES BREED ADVOCATES FOR YOUR BUSINESS ~ When you post a video, a link or a photo, fans can click the Share link for people on their pages to see! This will expose your business to even more people. On a profile page friends can share as well, but the only way for their friends to learn more about you would be to send you a friendship request. It is so much easier for Fans to share your information and send other Fans to your page to click 'LIKE' and get involved. Take advantage of the opportunity we have within Facebook. Facebook is not only the planet's largest social network, it's changing the way that people market their businesses. If you would like to see my Fan Page, click on this ink so we can also connect there as well... Heidi Hurd Fan Page! I would love to hear your thoughts on Facebook Fan Pages and how they are helping you to grow your businesses! Moving up the Pyramid of Success this week, I want to give you focus on your continued journey to the summit! The road to real achievement takes time. It can take a long time, but you do not give up. You may have setbacks. You may have to start over. You may have to change your method. You may have to go around, or over, or under. You may have to back up and get another start. But you do not quit. You stay the course! John Wooden reflected on his years of coaching and had this to say during one of his many interviews... "In 1948, I began coaching basketball at UCLA. Each hour of practice we worked very hard. Each day we worked very hard. Each week we worked very hard. Each season we worked very hard. For fourteen years we worked very hard and didn't win a national championship. However, a national championship was won in the fifteenth year. Another in the sixteenth. And eight more in the following ten years." You have to be completely determined to reach your goal! We All Want It, Not Everyone Gets It! Whether you are striving for success in your personal life or you are striving for success in your professional life.... We all want it! However, not everyone gets it! I know you are asking yourself, "Why and what do I need to do to ensure that I do get it?" John Wooden created what is known as the "Pyramid to Success." As one of the most successful coaches in history, he knew exactly what it took. Not everyday was a win, but even those days were necessary to work through. I want to spend the next few entries carefully constructing the necessary steps to help you discover that there are actionable steps you must take each day on your journey of achievement. The base of this pyramid is important as it is the foundation. Without these items on which to build, success will either not be attained or sadly, sustained! One: INDUSTRIOUSNESS ~ There is no substitute for work! Worthwhile things come from hard work and careful planning. Two: FRIENDSHIP ~ Comes from mutual esteem, respect and devotion. A sincere liking for all. Three: LOYALTY ~ To yourself and all those dependent upon you. Keep your self-respect. 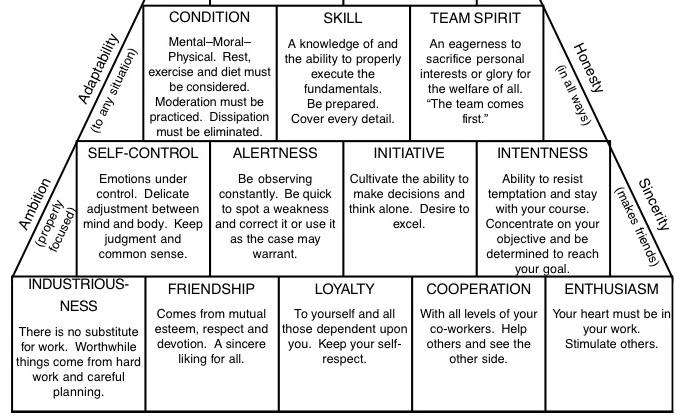 Four: COOPERATION ~ With all levels of your co-workers. Help others and see the other side. Five: ENTHUSIASM ~ Your heart MUST be in your work. Stimulate others. While these all seem basic and fairly easy to execute, be assured they take a very willing and eager person to see each of them through. Think about what it is that you are doing in each of these areas. Are you bringing the best you have or can you do better? 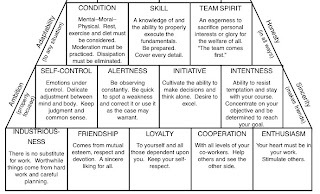 I know that these are items that need constant evaluation, but just be aware that they are the foundation to your Pyramid to Success! Many people set "resolutions" this time of year. To me, resolutions are for those that don't have the guts to call it a goal, write it down and set out to achieve it. Whether you seek success in your personal relationships or in your professional life, it is what is inside of you that will determine the outcome. In a word... you have to have POSTURE! You will hit plateaus. You will affect someones life. You will see how you are capable of more then you ever realized. Stay the course and a goal set will be a goal realized with a recipe that includes these ingredients for success!